The area around my hotel is a little bit strange. It is called the diplomatic area, but that is only part of its “charm”. 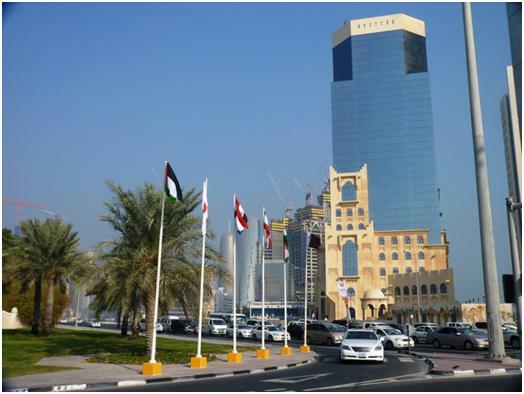 The embassy of the United Arab Emirates sits opposite the hotel, and is a low, whitewashed building surrounded by a similar whitewashed wall. It is anonymous as a building can be. Looking in the opposite direction though are all manner of tower blocks. Some of these may well be offices, but I think the majority are apartment buildings. The blocks are not anonymous, every single one is looking for some feature in order to stand out from those around it. Hence within the confines that no modern architect will use any building materials other than steel, glass and concrete, we have all sorts of design flourishes, curves, spikes, and the like. Some sort of Islamic motif is popular, so we have glass blocks seeming to rise out of the “ruin” of a traditional stone building, or large blocks with a domed roof. One feature many buildings here have in common, is that they are still under construction. Tower Blocks competing for attention. Between these blocks, the roads are all three lanes in each direction. Traffic however is sparse, but the traffic lights are set for a higher density, meaning you frequently wait for several minutes as nothing at all emerges from the side roads. The other side of town, however is a different matter, and our journeys to and from Khalifa have been dogged by lengthy traffic jams. It is with this in mind that we have some trepidation over our plans to see double header matches on the next few days. The opening matches in group B should prove the point. 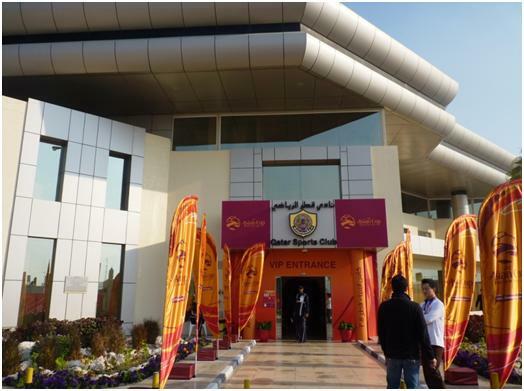 The early game is between Japan and Jordan, at the Qatar Sports Club, which is actually quite close to the hotel. I could probably walk it in 30 minutes. 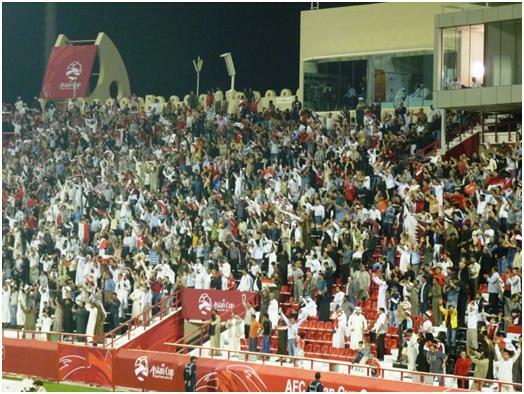 The later game is at Al Rayyan, the only stadium outside the Qatar municipality  we think it is around 25 kms. Kick off times are three hours apart. The games on Tuesday are in the same order, and on the same pair of Stadia, so we intend to go to the first match, and try and book a taxi to meet us immediately after the game to transport us onwards. If successful, we will repeat the exercise two days later, if not then the latter trip will be to the second ground alone. Japan clearly were in control of the early stages, although it took some time before they created a clear cut chance. 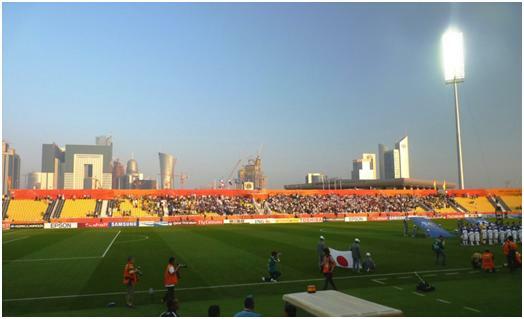 On 25 minutes Makoto Hasebe shot through a crowd of players, a shot which Amer Shafi could only parry. Maya Yoshida put away the rebound, but was ruled offside. Hesitation by the Japanese defence allowed Hasen Fattah to get a shot from around the penalty spot after 29 minutes. It was a soft effort and went directly into Kawashima waiting hands. It took a fine save from Shafi to stop Kagawa putting Japan ahead on 40 minutes. He collected a pass from the right just outside the area and then burst two defenders before unleashing a shot. Completely against the run of play, Jordan scored in the last minute of the first half, the shot from Hasan Abdel Fattah was heading straight towards the Japanese goalkeeper, but Maya Yoshida stuck his foot in the way, deflecting the ground shot into the roof of the net. The Jordanian fans, who were clearly the majority of the crowd went wild. Could this be revenge for the 2004 quarter-finals, when the Japanese, by persuading the referee to change ends partway through a penalty shoot out, cruelly defeated the Jordanians. At half tme, Japan changed their main striker, bringing on Tadanari Lee, Japanese born, but of Korean defence, who had played under-19 football for South Korea. Japan looked rattled at the start of the second half. Dortmund’s young star, Shinji Kagawa was seeing a lot of the ball, but he was failing to link with his team mates. Just before the hour, Stuttgart’s Shinji Okazaki came on, allowing Kagawa to move to the more central position he fills for Borussia. Jordan were doing a very good job in containing the Japanese, and pushing up, pressing and trying to keep the ball away from the Japanese in their own half. When they lost the ball, they were quick to fall back and hold formation, helped by the fact that Japan do not tend to break at speed. Still chances were being created with both Makoto Hasebe and Okazaki shooting narrowly wide. Taking off the lone forward Abdallah Deeb on 71 minutes, Jordan were now in a very defensive formation, with no outright striker. Jordan suffered a blow in the 77th minute when captain and influential defender Hatem Aqel was injured. Their resistance still held until into injury time, when Hasebe received a short corner and crossed it into the six yard box, where Maya Yoshida headed the ball past the slow to react goalkeeper. With a long period of injury time, mainly due to Hatem’s injury, Japan actually had chances to take an unlikely win, before settling for the point. 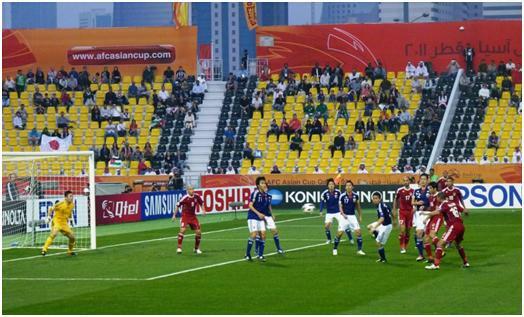 It was clear throughout the game that Japan had the more capable players, but they did not gel together well as a team. The team has suffered several injuries in the run up to the tournament, announcing two replacements at the deadline for changes (six hours before kick-off). They were also less prepared than most of the other teams here, with the climax to the domestic season not changing from its traditional New Year’s Day date. With this in mind, there is every chance they will improve for the other games. At the end of the game, it was about a ten minute walk before I reached the point where the taxi had agreed to pick us up. My compatriots, Paul and Kevin were waiting, but no taxi. However, another car had offered to take us for 100 Riyals, (around £18), which we would have taken, had the actual cab not turned up suddenly, taking us on the meter (for 38 Riyals). With a couple of worrying traffic jams, we actually took around 25 minutes before the taxi dropped us, (still with five minute walks to the actual gates). Still there was a little over 15 minutes to go when I entered the stadium, and with stops to pick up a media tribune ticket, and grab a coffee and sandwich, taking my place with the national anthems in progress. It turned out that Paul and Kevin had a much more difficult time, taking almost all the spare time in order to reach their gate, and only entering the stadium as the national anthems were playing. 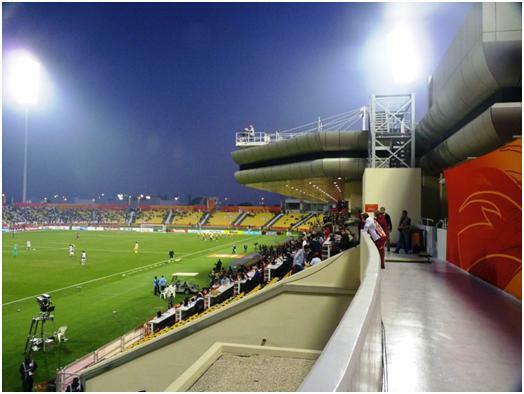 I do not have to describe the Al Rayyan (aka Ahmed bin Ali) Stadium, as my last post described Al Gharafa. The main difference between the pair is that at Al Gharafa, the seats here are red and black, rather than yellow and blue. After the classic finish, and the tense drive between games, I was pleased the game did not start in the most exciting of fashions. 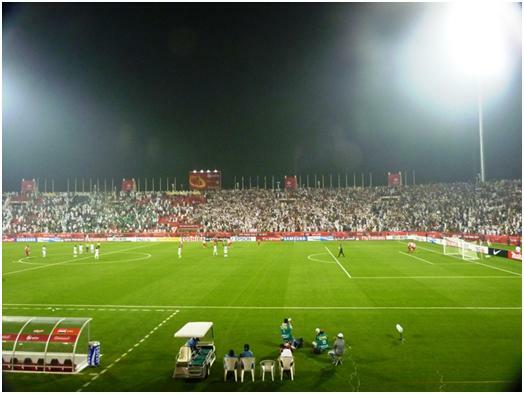 The atmosphere, however was electric with Syria having thousands of fans packing their half of the ground. Despite being closer, the Saudi Arabian team had only a fraction of the support. Apparently, there is a large Syrian ex-pat community with Qatar, which provides the basis of support. Our taxi driver late in the evening, who intended going to watch his team (India) play, felt that Syria, Iran and India would all benefit from the having very large communities in Qatar. Many of the Syrian supporters were standing throughout the game, and a crescendo of noise rose every time they went forward, or if Saudi just gave away possession. Although Saudi Arabia were considered favourites, the Syrians, maybe buoyed by the noise seemed to have the better of the early stages, and took the lead after a partial clearance on 37 minutes was met by Amer Dees who struck a well placed shot. The goal seemed to spur Saudi Arabia into action, realising at last that this game may not be as simple as they thought it would be. Syria, after all are the only team to have come through the qualifying stages unbeaten, and they finished above China in the group. Saudi launched a series of raids down the wings at the start of the second half, and made two substitutions to improve their attacking options, the first of these was Taiseer Al Jassam, who came into the game at half time. The Syrian keeper punched out a corner on 60 minutes, only for Taiseer to head the ball back towards the goal, now the goalkeepers sight line was blocked by Naif Hazazi (the second Saudi substitute), and he did not see the ball until it was too late. Within minutes, Syria had regained the lead as the match on the field began to match the excitement in the crowd. The move started on the left, but the ball was crossed too long to be effective. It was then headed back to a more central position where Husein was in position to take his shot, and with a major deflection, Syria scored again. Having scored twice Husein, who had started the game as a defensive midfielder, moved up to be an attacking midfield role, after Adel Abdullah had come on as substitute. Saudi were now committed as an attacking force, but this made for an exciting game, as there were chances on the break, and both Husein, and Syria’s second substitute, Qussai Habib were keen to try and exploit the gaps. Meanwhile Saudi Arabia hit ball after ball into the area, where at times it seemed to bounce around like a virtual pinball. Mosab Balhous made a fantastic save from the head of Nawaf al Abid to keep Syria ahead as the game entered the four minutes of injury time. He then spent a minute getting treatment before the corner. The crowd was now getting noisier with each clearance- surely someone was going to step in and demand a decrease in decibels under health and safety legislation? This entry was posted on Monday, January 10th, 2011 at 06:30 am and is filed under Asia 11. You can follow any responses to this entry through the RSS 2.0 feed. Both comments and pings are currently closed.